Julia Hoon never could’ve overcome a vicious assault during a walk home from the store without her dog. Gracey Evans has a hidden scar from a horrific school assault but was able to move forward with the aid of an emotional support animal. And Ryan Finn has persevered struggle after struggle to get through college in high spirits through his dog. With tragedies happening all over the world, animals have become more than just a family pet. Animals have become emotional support companions to people of all ages, and here in Pittsburgh, students are benefitting. 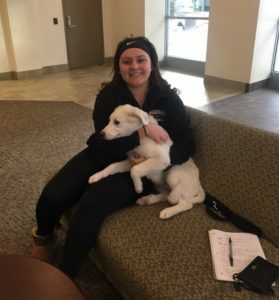 College students in Pittsburgh are among many students across the country finding that emotional support animals to provide comfort in a way medication cannot. “My dog is my prescription basically,” said Hoon. Many universities in Pittsburgh have no-pet policies, but the Fair Housing Act requires schools to consider requests for emotional support animals on campus. Under obligation, the head of student affairs must require a formal request be filed through the office, documentation of the disability from, and then a dialogue with the student to establish disability, according to Leigh Culley, director of Disability Resources and Services at the University of Pittsburgh. If it is determined the student does have a disability and an emotional support animal could reduce symptoms, then the student can be approved. If the student has a roommate, the roommate has to provide written consent to have the animal in their room. Both students have to agree to house the animal in their room and agree they are both responsible for its wellbeing. Students provide a description and photo of the animal for the school to keep on file which is passed on to resident advisors and security guards of their residence hall. Once contracts are signed and agreements made, students update their information on having an emotional support animal each year. 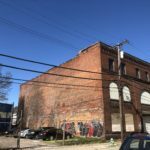 Freshman year, Julia Hoon, a student at Point Park in downtown Pittsburgh, was walking back to her residence hall from the 7/11 about two blocks away from the university when a group of men jumped her with the goal of stealing her wallet. She fought back, determined not to go down completely and still has bone fragments in her knuckles from the blows she threw. “I was fine by the end, I had the crap beaten out of me, but they wanted the wallet and they didn’t get it,” Hoon said. Post-attack, Hoon felt paranoid. “I would constantly get this paranoia that everyone wanted to hurt me,” Hoon said. A sophomore now, Hoon was diagnosed with Post Traumatic Stress Disorder from the ordeal. Not being a fan of medication, Hoon was desperate to find another way to cope. She found her dog, Krieger, online as a puppy and knew immediately she wanted him. “I’ve always been uncomfortable with medication and the idea of something chemically altering my brain, so my parents and I talked about alternative options and figured a dog would help,” said Hoon. For her, the process of obtaining an emotional support animal was simple and quick. She received an official diagnosis from her doctor and bought Krieger shortly after. “He is almost 4 months old, all my issues dissipated once I got him,” said Hoon. Trusting Krieger’s instincts, she knows how much she wants to be around a certain person based on his reaction to them. “He’s a very friendly dog, but he growled at one person already and that just let me know I’m not going to be around them very much,” Hoon said. As a survivor of an attack, Hoon has found peace with Krieger. With him, she finds it easier to live her life and enjoy college. Gracey Evans fights a similar battle but has her cat Moose to help her fight it. In 2014, Franklin Regional High School experienced a stabbing which resulted in 22 injured students and faculty. Evans was a direct witness to these stabbings, and even put herself in danger to help several victims. “I saved two people’s lives, the first kid I put pressure on his wound, and if I hadn’t done that I don’t believe he’d be alive today. And then my best friend I was able to keep him calm while we waited for the ambulance, he was stabbed right between his spinal cord and his lung, he could’ve been paralyzed, but he got lucky,” said Evans. After the attack, Evans found herself fearing the attacker would find her and kill her, so she started seeing a therapist for her PTSD. “People glorify mental illness, but having PTSD, I can’t process things normally. It forced me to grow up, I see things differently than I normally would have if I didn’t have chronic PTSD,” Evans said. For Evans, the signs of PTSD started showing about a week after the attack. Her first therapist made her relive the attack, not helping or minimizing her symptoms. “I was in a dark room, with no windows, or light and it just didn’t make me feel safe,” said Evans. Her second therapist helped her. She created a safe environment for Evans to work through an episode or issue she’d gone through that week. “I try to keep her updated as much as I can, she has a lot of appointments that make it hard to meet with her, and that’s where Mosse comes in,” said Evans. Growing up with cats, Evans and her family began to consider the possibility of her having one at school after seeing the effect the stabbing had on her. Evans adopted her emotional companion at Fayette Friends of Animals last April of 2017. On a rough day, Moose provides Evans with the love, comfort, and peace she needs. Her process to make Moose legit as her emotional support animal was also simple. With an official diagnosis of chronic PTSD from her doctor and a referral from her therapist, Her main concern was registering Moose through a registry. This process costs her about $80 and Moose was officially her emotional support companion. Moose was not formally trained to provide emotional support, but Evans knew she’d found a cat that would love her unconditionally. 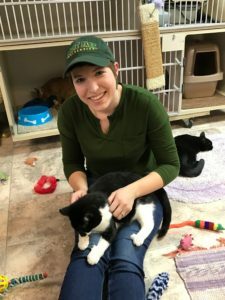 “Some of my cats at home are not as lovey-dovey, but moose loves being held, rubbed, pet, and he loves talking which makes me laugh,” Evans said. On a bad day, it’s things like him “meowing” at the wall or jumping on her roommate’s desk that remind Evans why she chose moose to get her help her through her rougher days. “Emotional Support animals are amazing, especially when you have a mental illness,” said Evans. Ryan Finn struggled with keeping himself on a consistent goal-oriented path before his emotional support animal. Finn grew up with two dogs, and throughout his entire life found they always gave him comfort when he was feeling low. For him, transitioning from high school to college was where things got hard. “Moving out, I came to two realizations, one, I was lonely, and two, I missed my dogs,” said Finn. As a freshman going into college, especially a big university like the University of Pittsburgh, Finn began to feel the pressures committing to a future path. Having gotten one of his dogs at home registered as his emotional support animal before, Finn began looking for his own dog to take to school with him shortly after moving out. “I didn’t really fully know how much of an impact it would have on my life, but for me, the routine schedule of taking care of an animal kept me on track,” said Finn. Starting fresh this year, Finn went into his classes and his relationships with his emotional support animal with the determination to move forward and not look back. Reflecting on the past two years he spent at Pitt and with his Beagle mix, Beau, he can say that life is a little easier.